I thought the advice I got while pregnant was bad -- the horror stories of what would happen, both during the birth and once the baby was home. But all of that did not toughen up my skin or prepare me for the continued advice and poking questions I seem to get. SHOULD she be in school programs? She's 10 months old. Is she already at an age that I can't provide her with the stimulation she needs? Does she need more socialization than library story time, the church nursery and the playground can provide? AM I DOING EVERYTHING WRONG? Just writing this out makes my insecurities seem less important and likely a waste of my time fretting them. I also need to be a better listener to create some real mom friendships. Developing friendships is very difficult for me in any case, and adding this weird self-consciousness about my parenting choices seems to make it that much harder. 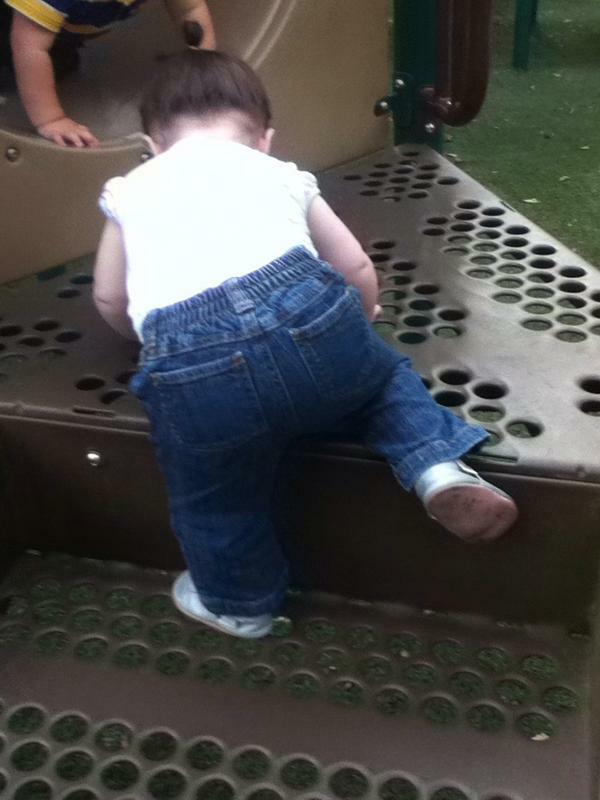 But the main thing is, Jane looks so cute in her little jeans. I like the tone of this contemplation, NOT because you are likely doing anything "wrong", but because it seems your mind is open/curious to new understandings. There is no wrong path (at least until somebody turns twelve, or whatever!!) aaaaaaaaand no parent ever gets enough sample size to really "KNOW" 'right' from 'wrong'. Just keep making the best decisions based on what you know in the present, and don't sweat the small stuff! !